For…well forever, the fashion industry and magazines have been heavily criticised for overly photoshopping pictures.I’m often shoving Lancome/Estee Lauder adverts at my friends, exclaiming ‘Look! She has no pores!’. And it was only last week that I put up pictures of Gisele with her baby bump airbrushed out, oh and don’t get me started on the state of Madonna’s face in the new Louis Vuitton advert! Thankfully, it seems like someone is trying to buck the photoshopped to death trend. Peter Lindbergh has adopted an almost no makeup/no retouching aesthetic which is welcome and very refreshing. These images are from Harper’s Bazaar, September issue. LFW is looking to be a very busy affair. 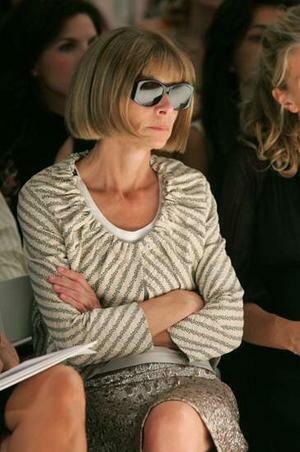 Anna Wintour is attending, it’s the first time she is gracing the London shows with her presence since 2007. It was kinda inevitable seeing as Burberry Prorsum, Jonathan Saunders, Matthew Williamson, Pringle of Scotland, and others are returning to show in London after seasons showing elsewhere. It’s rumoured that a lot of US stars are making a trip to London during fashion week, with most of them making a beeline for the Topshop show. Linda for Gaultier, let down? When I think of Galliano, I think of drama. I love that his campaigns have the same red frame, eye catching. For his Fall 09 campaign, Linda Evangelista was the model of choice, seemed promising. But to me, it’s pretty boring..and just blah. But hey, I might just be a tough critic, what do you think? Wow, Angie is looking fierce again. Those floaty chiffon dresses she’s been sporting over the last couple of years are nice enough but she’s killing it in this leather Michael Kors dress. Teeny Vogue: The September issue of US Vogue is the super svelte, at a mere 584 pages. Model Idol:In case you’ve been living under a rock, Simon Fuller (American Idol) has bought a majority stake in Storm Models, agency of Kate Moss, Lily Cole & Jourdan Dunn among others. Sessilee 4 Tyra:Sessilee Lopez is eyeing Tyra’s Model/Mogul crown, she wants to follow in her idol’s footsteps. i really like the black and white photos of peter lindbergh. some people don't realise that one of the most beautiful things is natural beauty. Angie is so great! This dress is fantastic, but she is too slim and her head looks so big! Although still amazing, love this girl so much! Hi love! Thanks for another amazing post… It's kind of funny that people are making such a big deal about A Wintour attending LFW because it's not like Brit designers are an infant industry or anything. I have always been a fan of LFW talent and when I attended for the first time last season I was blown away at how well everything was organized. I especially loved how nicely the on and off schedules were posted… Very helpful. Hope you had a wonderful weekend..
Hi my dear-great post as usual, and totally agree about Angelina-I adore her, but she looks just gorgeous here! Have a great weekend!! I totally agree that the madonna lv photos are absolutely ridiculous!Great post!Would u like to exchange links? !